Have you made any resolutions? Personally, I’m not one for resolutions – not because I don’t need to make them, but because I am not very good at keeping them so why set myself up for failure?! But, this is the time of year when we reflect on the past and put our plans in place for our future. I was doing that a year ago when this blog was just an idea. I read a lot online and recently came across this article on The Guardian, “You can’t detox your body. It’s a myth. So how do you get healthy?”. Not surprising that an article like this is posted towards the end of the year when people are thinking about kick starting their “new self”. It’s a good read, although definitely one sided. As a person who once (in a weak moment) purchased detox foot pads from a silly television commercial, I wanted to hear more and thought it might be a good topic for this first post of the year. I remembered a conversation I had a few years back with my friend, Francine. She and I were working on a food related project and the topic of detoxing came up. I can’t remember the context – maybe I confessed about the foot pads. In any case, I remembered her telling me that she didn’t believe in detoxing and that the human body is set up to self cleanse. Hmmm, ok. So, those foot pads were a hoax, I get it. But what about juicing? It seems so popular. Goop has an entire section devoted to Detoxes/Cleanses! What’s the deal? Francine is a certified health coach and a 2007 graduate of the Institute for Integrative Nutrition. She is certified by Columbia University Teachers College and the American Association of Drugless Practitioners, and currently serves as the Vice President of the board of Gaining Ground in Concord, Massachusetts. She is also one of the nicest people in the whole wide world. I got in touch with Francine to see if she would offer some thoughts about detoxing for this week’s post and to tell us how she restarts her healthy self after the holiday season. I am so glad I did as her approach is an easy to follow, sustainable road map we can all use. She took time away from her family vacation to do this for me so I am most appreciative. “I don’t believe in “detoxing” because it’s not only unnecessary but also can be harmful. Our bodies are designed to “cleanse” themselves naturally and expensive, restrictive programs including shakes, juices and supplements do nothing to promote long-term healthful eating and do not supply vital nutrients or fiber. In my opinion, it’s far better to focus attention on eating healthfully and mindfully, especially after all the holiday cocktails and cookies. I am not concerned about extra calories and so-called “bad” holiday food because I have been enjoying the special meals and time spent around the table with family and friends. When I return home from vacation, instead of “detoxing” I focus on all the good things I CAN eat and don’t think too much about the things I don’t want to eat. ♥ Sipping water and herbal tea throughout the day. It helps me feel full and is great hydration for my travel-stressed skin. ♥ Sitting down, relaxing and enjoying my meals and snacks. I make time to slow-down and eat well instead of grabbing something on-the-go, or worse, skipping meals. This helps me create a feeling of calm and well-being instead of senseless self-denial. ♥ Focusing on eating an abundant variety of fruits and vegetables. After the holidays, I head to the market and stock up on all my favorites in the produce aisle, plus a few that are less familiar like persimmons, blood oranges and celeriac. ♥ Cooking soup. I love to make a big pot of vegetable soup to enjoy all week. I simmer mine with carrots, celery, leeks, cabbage, kale, celeriac, garlic and white beans for a quick, filling and nourishing meal anytime. This is just what Francine wrote over email. On the phone, we spoke about The Guardian article and agreed it was forceful, but consistent with Francine’s approach. It did not; however, offer solutions which is why I thought Francine’s input would be helpful to include today. Francine really believes in creating sustainable habits for ourselves, rather than buying into fads or quick fixes. She feels it also allows us to be kind to ourselves as we “atone” for the holiday helpings. I do not personally have the knowledge that Francine has, but I do know what works for me when I want to get myself back on track. Lots and lots of water, consistent exercise, lighter meals, lots of vegetables and a stretch of good sleeps (hard to do) definitely help. I’ve also discovered dandelion root tea to help with an upset system. It isn’t that tasty, but it has worked for me after a stretch of indulgence. I really like Francine’s idea to sit while eating a snack. I often take mine on the go. Even though the article suggests Broccoli gets way too much glory as a superfood, it is the star of this week’s recipe. Broccoli Salad with Peanut Sauce was inspired by a recipe I saw on the blog Gimme Some Oven. 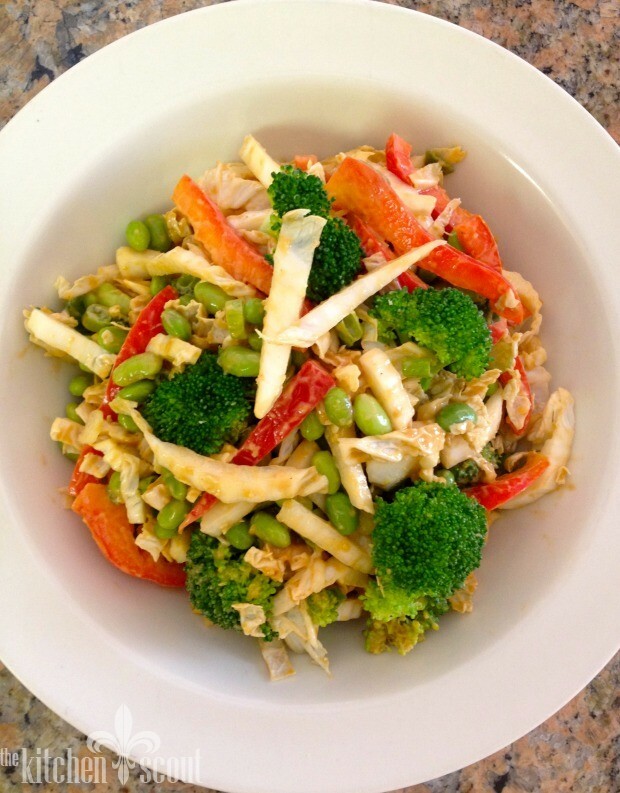 My salad has broccoli, napa cabbage, red peppers, black-eyed peas for New Year’s good luck (or edamame like the inspiration recipe) and is dressed with a delicious peanut sauce. The sauce is more complex than the inspiration recipe and was inspired by one I use a bunch from The Blueberry Hill cookbook. 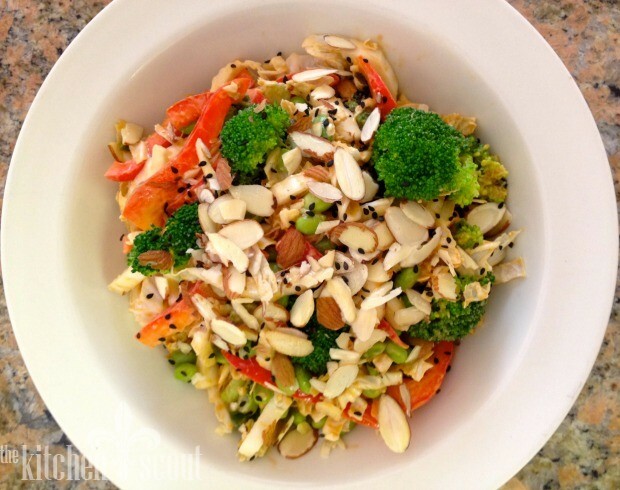 The salad is garnished with sliced almonds and black sesame seeds. As a side note, I made so many versions of this during the past week and the hubs, who ate more of it than he ever imagined he would, prefers the edamame to the black-eyed peas. Francine reviewed the recipe while it was under construction and she thought it was a complete meal. She offered that the salad contains plenty of plant based protein and fiber from the beans, almonds and peanut butter; fiber, cancer fighting elements and Vitamin C from the broccoli, cabbage, red pepper and garlic; anti-inflammatory from the ginger; and, healthy fats from the peanut butter (especially if you use all natural). The peanut sauce itself is great to have on hand. Francine whips up big batches of her favorite recipe and uses it as a dip for vegetables, tossed with pasta or as a dressing for a slaw. Hopefully, Francine’s tips can help us all stay or get back on track and start off the new year with lots of positive, forward thinking energy! Various pictures of the salad, with garnish, without garnish, with edamame, with black-eyed peas. So. Much. Salad. 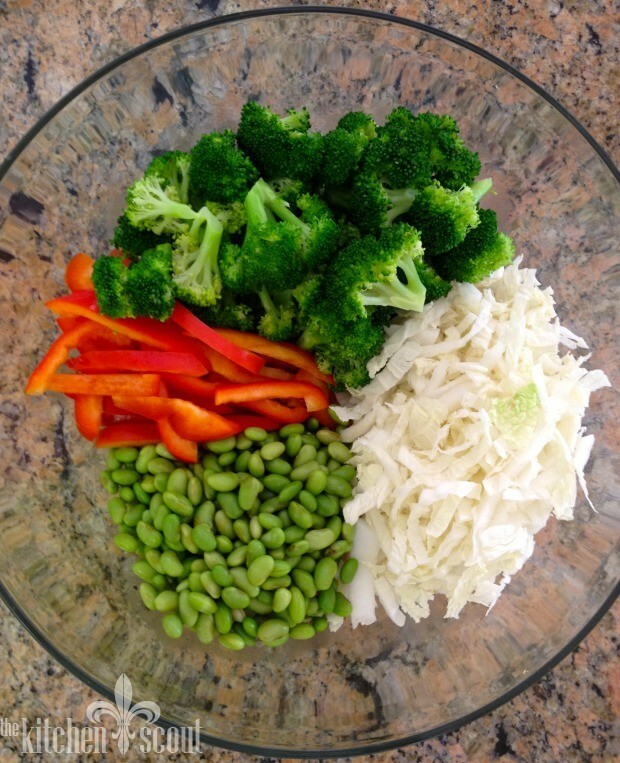 For the salad, blanch the broccoli florets in boiling water for 1-2 minutes. Shock in ice water, drain and pat very dry. 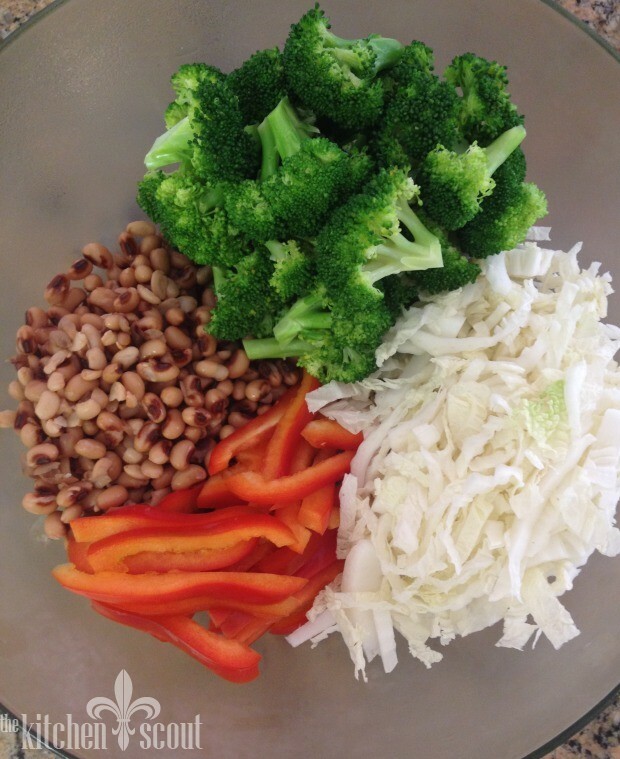 Add to bowl with cabbage, black-eyed peas (or edamame), red pepper and scallions. For the sauce, place all ingredients in a food processor and blend until completely smooth. Add optional heat elements slowly and taste. If you overdo it, just add a little more soy or rice vinegar to balance the flavors. Add the sauce to the salad (you may not need all of the sauce so add a little at a time. You may want to use any extra to rehydrate salad on day two). 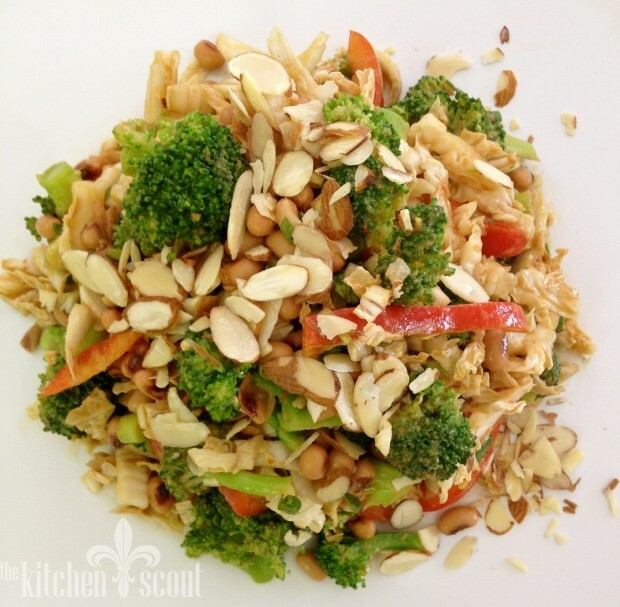 Garnish with the sliced almonds and the black sesame seeds. Wow – Francine is my friend too and, I agree, one of the nicest people in the world! I should have known we would be on the same wavelength on this whole detox thing – I am a yoga teacher and my students are obsessed with it! I posted the Guardian article on my yoga FB page but I agree it stopped short of offering any practical advice. So I will post the link to your blog with my dear friend’s words of wisdom and your delicious recipe. 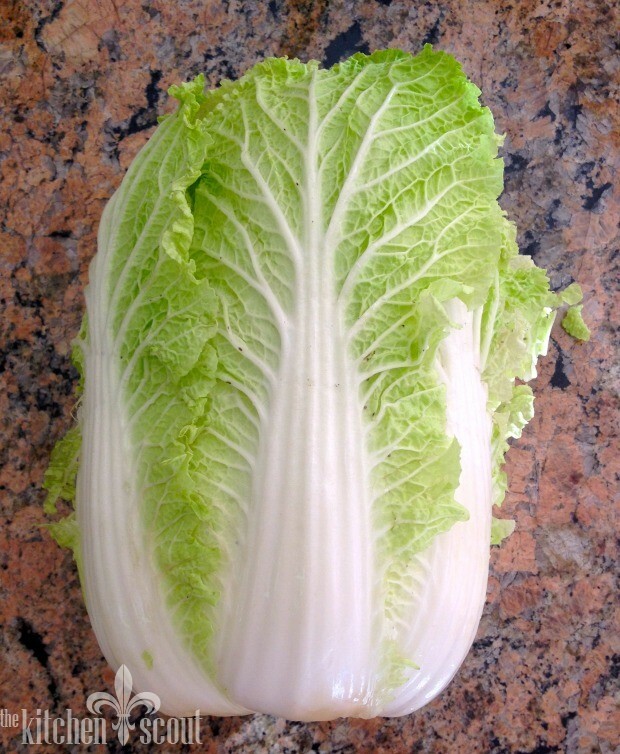 Thank you for illustrating the Napa cabbage – here (in London, UK) it’s called a Chinese cabbage, so thank you too for using everyday, ‘storecupboard’ ingredients. I think the whole detox industry is based on getting people to buy powders, teas, obscure (and expensive) foods and useless products (like footpads), rather than letting our bodies do what they were made to do!